Our entire selection of Red cabinet colors can be viewed on www. eldstonecabinetry.com. Shown here on the Hanover door style in Cherry. Paprika is a Stain  nish. Shown here on the Reading door style in Cherry. Brittany is a Stain  nish. Shown here on the Parkside door style in Rustic Alder. Burgundy is a Stain  nish. Shown here on the Rockingham door style in Rustic Alder. Homestead Red is a Tinted Varnish-based Specialty Color. 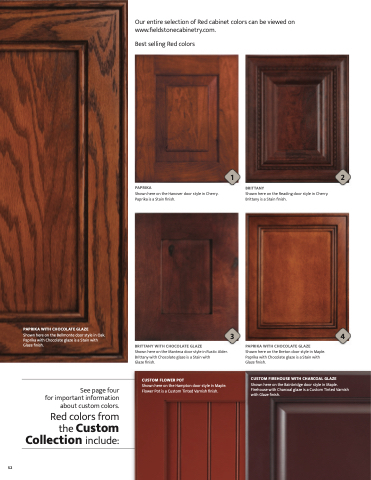 Shown here on the Seville door style in Cherry. Brittany with Chocolate glaze is a Stain with Glaze  nish.